Climate change hotspots mapping: what have we learned? 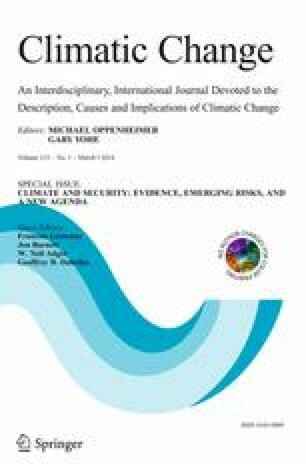 In the past 5 years there has been a proliferation of efforts to map climate change “hotspots” — regions that are particularly vulnerable to current or future climate impacts, and where human security may be at risk. While some are academic exercises, many are produced with the goal of drawing policy maker attention to regions that are particularly susceptible to climate impacts, either to mitigate the risk of humanitarian crises or conflicts or to target adaptation assistance. Hotspots mapping efforts address a range of issues and sectors such as vulnerable populations, humanitarian crises, conflict, agriculture and food security, and water resources. This paper offers a timely assessment of the strengths and weaknesses of current hotspots mapping approaches with the goal of improving future efforts. It also highlights regions that are anticipated, based on combinations of high exposure, high sensitivity and low adaptive capacity, to suffer significant impacts from climate change. The online version of this article (doi: 10.1007/s10584-013-0900-7) contains supplementary material, which is available to authorized users. The author would like to acknowledge comments on an earlier version of this paper by Richard Sliuzas of ITC/University of Twente and by three anonymous reviewers. He presented earlier versions of this paper and benefited from exchanges with researchers at the ICARUS II and Adaptation Futures conferences in May 2012.